After I demonstrated the Queen’s University Library (QUL) website at the December 2017 UGME Curriculum retreat, Dr Sanfilippo asked me to prepare an entry for this blog with further information about the site. The changes to the website that occurred in the fall of 2016 were quite dramatic and many of you sent us feedback about the new QUL web pages. During the 16 months since the new QUL website was launched, the librarians collected this user feedback and worked closely with the Library staff to implement a few features that would benefit all our users. The Bracken Library physical space page: this is where you reserve a library group room, check our hours and other services related to the physical collection (e.g. signing books out, requesting materials) and using the library spaces. 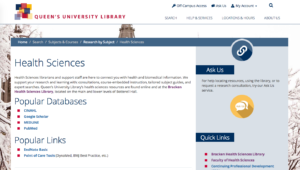 The health sciences collections subject page: this is where you find access to health sciences databases and resources such as the point-of-care tools, mobile apps, multimedia materials. This page is grouped with all the other subject pages on campus, which you can find on any library page under “Search/Research by Subject” in the top banner and menu. Based on user feedback, the Health Sciences subject guide was edited in 2017 to provide quick access to health sciences resources. Some of the most important resources are now at the top of the page, e.g. Medline, CINAHL, PubMed1 and Point-of-Care tools. You will however want to look at the subject guides prepared by librarians to support your research and teaching information needs. There are subject guides for Nursing, Medicine, Rehabilitation Therapy, and Life Sciences and Biochemistry. 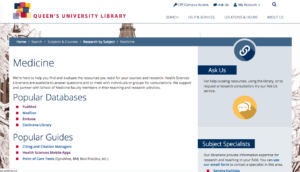 To access health sciences resources quickly, add the relevant subject guide link to your web browser favourites list and learning management software for students in your classes. We also have guides that highlight resources for specific programs or topics (e.g. Aging and Health, History of Medicine), and guides that are more about tools such as citation management, avoiding predatory publishers and the one with approaches and resources to develop systematic reviews and other syntheses. Check out the complete list of guides on the Health Sciences Subject page. These guides are prepared for you BUT we would love your input: if anything you find worthwhile could be added to the list of resources, please let us know. Any resource format can be included in addition to books and journals: websites, videos, images… if you find something useful, whether in our library collection or on the web (for the latter we will ensure that it can be shared widely), please send us a note. And of course, if you think that a new guide could be developed to support your teaching and research areas, please contact us. Best wishes for happy searching and be sure to reach out if librarians can help you locate and organize information (remember, we love doing this and just maybe… you have other things to do!). Please continue to tell us what you think of the new library web pages. 1Note that searching Pubmed via a library page brings all the links to full-text available via the QUL collections.